Spring has sprung here in sunny California. Beautiful flowers, a couple of earthquakes, and tender spring vegetables are in season. Asparagus is one of my faves, perfectly in season in April and May, and possibly the easiest side dish to make. Along with peas, leeks, artichokes, and strawberries, we are moving into the part of the year when fresh fruits and veggies are abundant and flavorful, which means I go into a cooking frenzy and don’t resurface until football season starts. Quick tip: when prepping the asparagus, wash and dry, then bend the spears until you feel the natural snapping point at the bottom, then snap off the tough ends to make sure you are serving only the tender part of the asparagus. Asparagus roasts so easily, keep an eye on those delicate suckers so they don’t burn. Preheat oven to 400 degrees. Place foil across a small baking sheet. 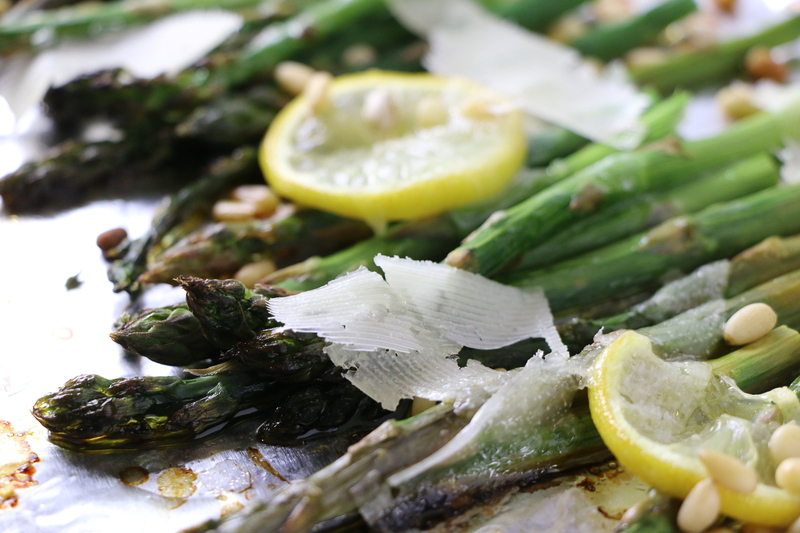 Lay asparagus spears flat, drizzle with olive oil, a squeeze of the lemon juice, and season with salt and pepper. Place lemon slices and sprinkle pine nuts across asparagus. Roast in oven for 15-20 minutes, or until desired doneness. Garnish with freshly grated manchego cheese, serve. LOVE the new blog look Ana! We were just talking about your blog over lunch today and then I come to get a look tonight and what a pretty surprise! Thank you, Tiffany!! And likewise your blog is gorgeous–thank you for stopping by, lovely!! Love the groovy new look of the site – your recipes are great. Question @ cooking at 400 degrees with olive oil – I had been told the smoke point was too low on olive oil for roasting and to use grapeseed oil for roasting and put on the olive oil afterwards, what do you think?